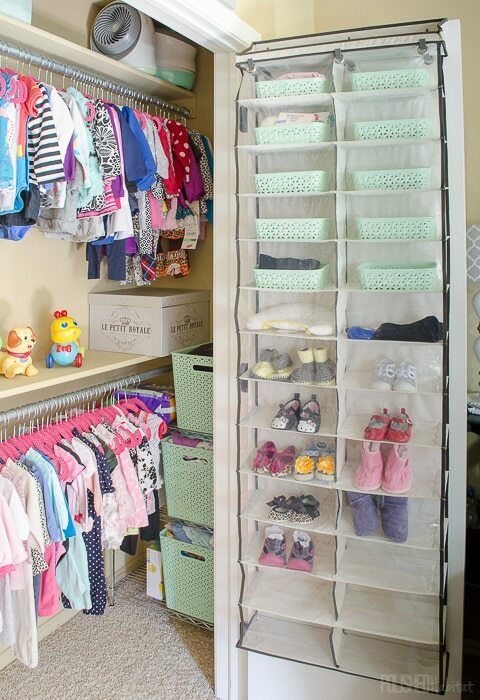 Have you got a baby or kiddo with an out of control closet? 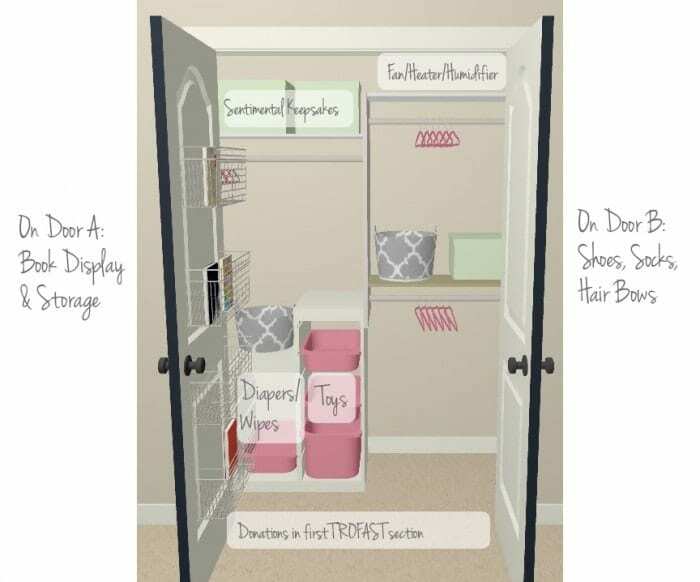 I recently had the chance to organize a baby’s closet, and had fun thinking of affordable ways to add flexible storage that will grow right along with baby. I shared the before photos and my plan a few weeks ago, but here’s a quick recap if you missed it. It’s a pretty standard double door closet, that already had a great amount of hanging space. There were a few big problems that all boiled down to stuff that didn’t belong in the closet being in the way of things that needed to be there. 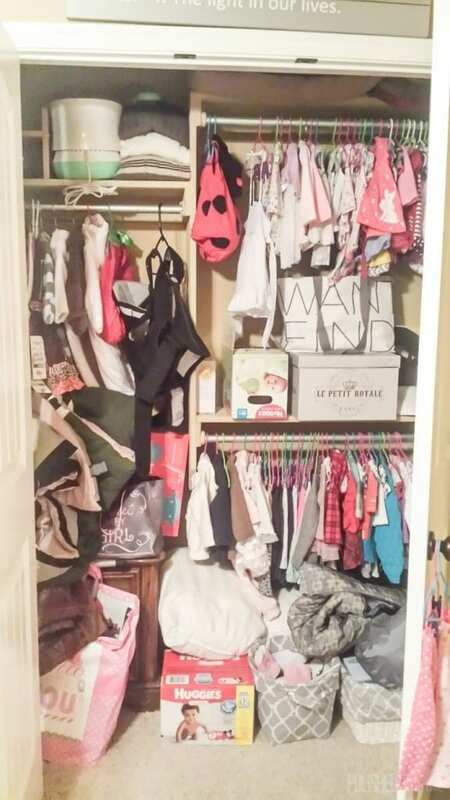 During my first visit, we sorted through the closet and removed all the non-baby items. Some were able to be donated, and other items went to the attic. We also talked about what needed a place in the closet that didn’t currently fit. Here’s the list of what we needed to add. With all that in mind, I measured the space and came up with a plan that would work great now, but leave lots of flexible room as baby grows into little girl. I knew I wanted to use the back of the closet doors to add easily accessible storage, and I had one of those rare light bulb moments with a vision of one door becoming a library. I wasn’t sure HOW, but I was obsessed with figuring it out! The solution was way easier than I expected. I bought this pantry organizer! They come ready to hang on the closet door, but I found that it didn’t stay as tight to the door as I wanted. It swung when we opened and closed the door. 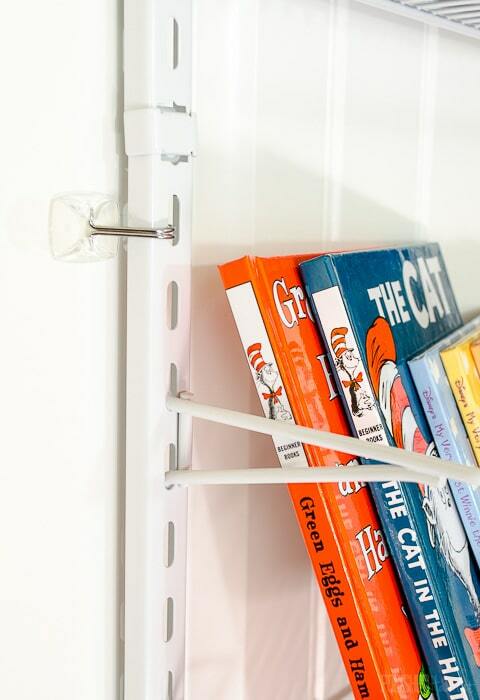 Luckily, wire utensil Command hooks perfectly hook into the holes and keep everything secure. It’s an added cost, but I wouldn’t recommend doing this project without them. I used the braces that came with the organizer to keep the books from flopping every time the door moved. For the very top section, we were out of braces, so we tied a wide ribbon across the books. It works just as well! 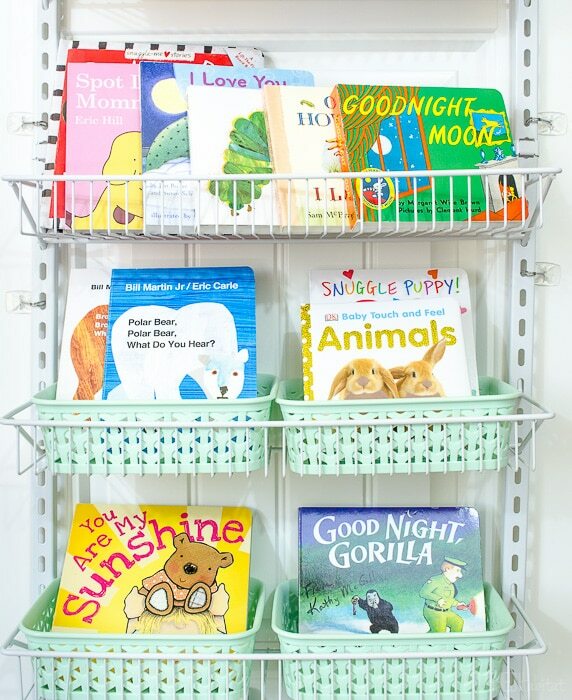 For the bottom sections, I used super cute mint green plastic baskets from Target to hold the smaller books. Sometimes you get really lucky and bins fit PERFECTLY. Happy day! Inside the closet, we added an IKEA TROFAST unit. Toy storage galore! The large TROFAST bins are also great for things like extra wipes & diapers that don’t fit in the changing table. This little girl is just getting to the age of accumulating toys, so for now we are leaving the bins unlabeled. As she gets older, the toys may get divided out into labeled categories. On the upper closet shelf, I added some marbled mint milk crate bins from Target. They are being used for those sentimental items that baby has outgrown, but mom wants to keep. Side note: I REALLY want to redo my office closet with all this mint cuteness. Another big change in the closet was a hanger swap. 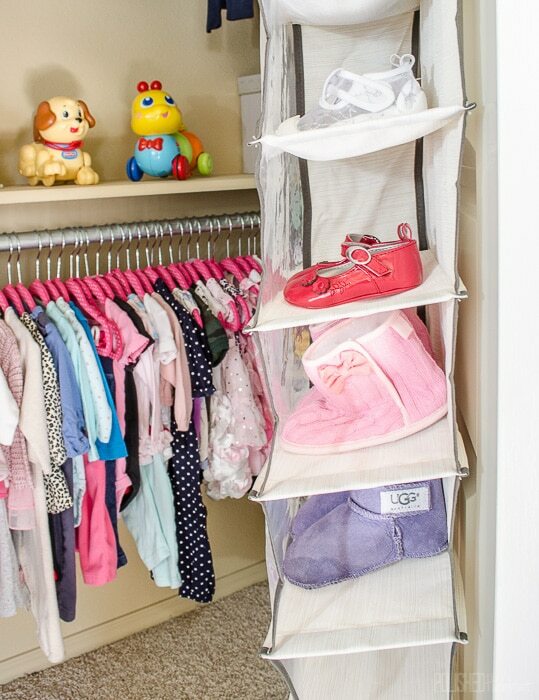 Uniform hangers make the space look less busy, and the velvet slim hangers save space and keep clothes ON the hanger. We ordered a pink polka dot version from Amazon that are ADORABLE. Reviews say these work great up through kids size 6-8, so the family will get years of use out of them. As we did the hanger swap, we also sorted the clothes by size. Everything the current size went on the bottom row, with bigger sizes up top and then winter gear on the opposite side of the closet. 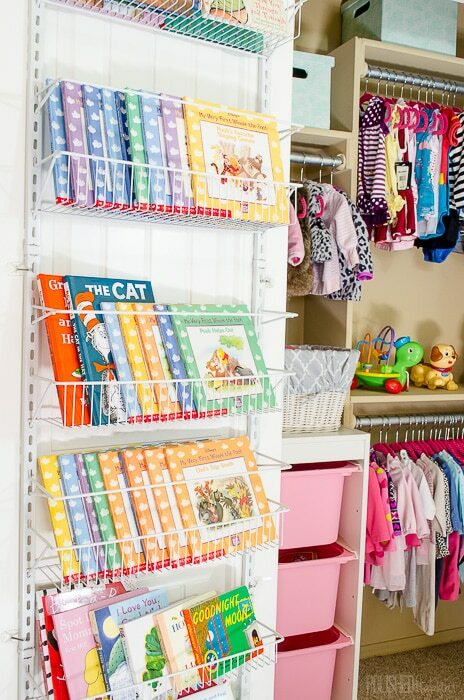 If you just have one hanging rod, check out this tutorial for super cute size dividers. On the right side of the closet, we reused an existing wire shelving unit and filled it with larger versions of the mint Target bins. 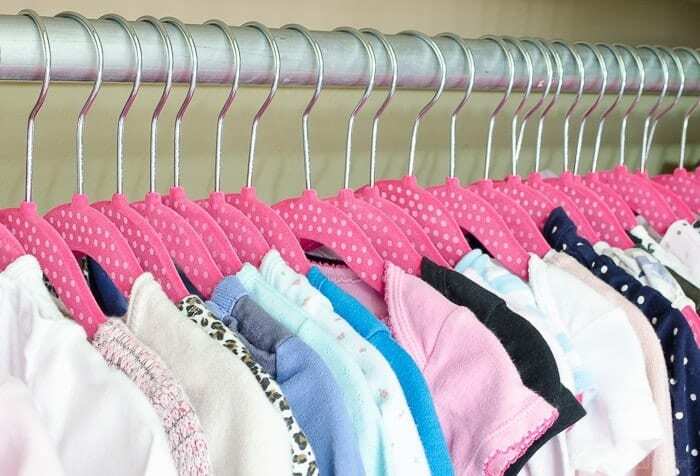 These are great for clothes that are outgrown and needed to be sorted for donation/passing on to others. Now if something doesn’t fit anymore, it gets tossed right into the bin. Extra blankets also live in one of these big baskets. SO MUCH STORAGE! As I’m sure you noticed, we didn’t let the second closet door go to waste. I found an over the door shoe storage unit that I like SO MUCH BETTER than the usual kind. The openings are deeper, so each one is essentially a little shelf. You can get the same one at Target or Amazon. The openings are the exact size to hold those same small mint bins I used for books on the other door. And inside the bins there are lots of little baby socks! 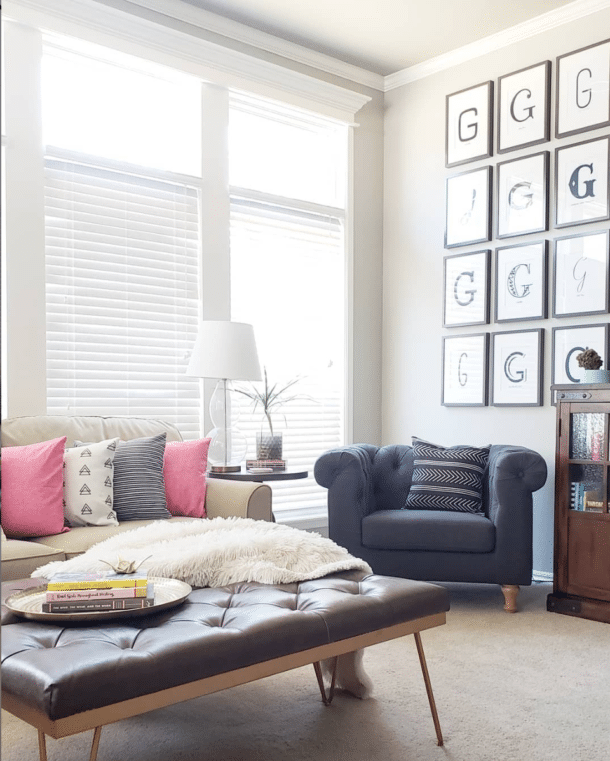 I was so honored to help this family change a spot of stress in the house into a spot that works for them and makes their busy mornings a bit easier. And here’s one final pinnable image that shows the before and after in one place. What’s your favorite part? I love it ALL! 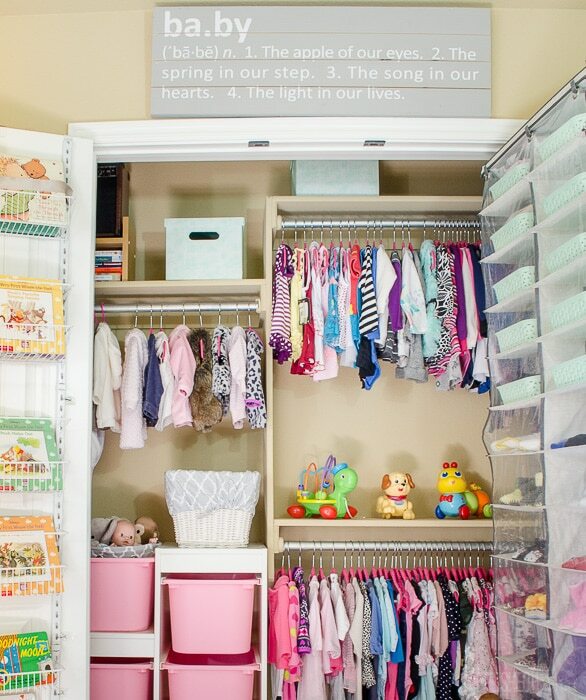 Am sending this post on to my daughter who has 3 girls and TONS of clothes and shoes….inspirations and ideas!! Thank you!! Oh good! I hope she finds some of the ideas will make their mornings easier! 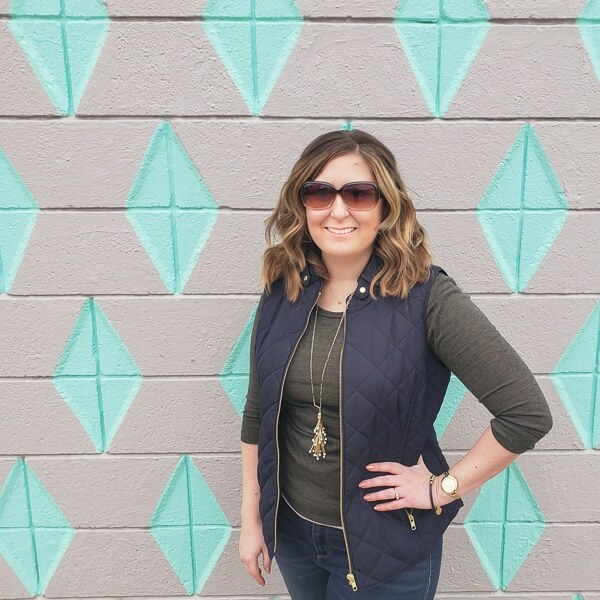 My favorite part is everything, but I even had my husband come look at how you did the doors. 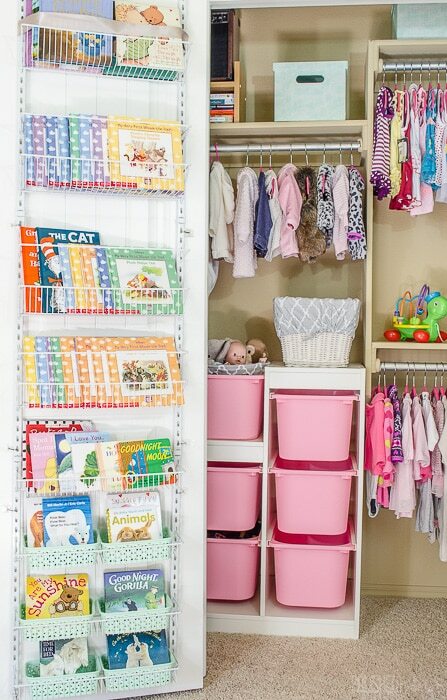 🙂 Lots of inspiration for us, as we’ll be doing two kid closet makeovers this summer. Thank you! So glad it was good timing for you! And I love that it hit the ‘show the husband’ threshold because I do the same thing at our house with ideas I really love! 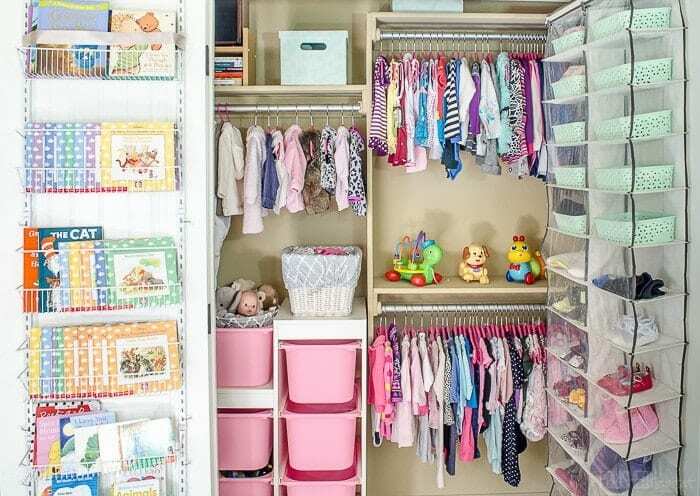 I thought I had all my kids closets organized—-NO WAY, I think I will need to steal some of your tricks. This is great! Oh no, I’m so bummed they are out of stock online already too. I’ll keep my eyes open in case any get returned to my Targets. Holy cow! Such an improvement! I am dying over those mint baskets you used. This is beautiful and inspiring. wondering which render program didi you use to design the plan? Here’s an Amazon affiliate link right to the one I use http://amzn.to/28YLvI3 . It’s not totally intuitive and I found myself searching their forums a lot in the beginning, but now that I passed the learning curve it’s so worth it. Really powerful for the price. Do you know what size those bins are that you have in the shoe rack? I got the shoe rack (all because of your site!) and I was going to see if I could order some online. Hi Danielle, they were the “extra small” size. Hopefully they’re available in a different color now, because they fit perfectly! What is on top of the shoe organizer, it seems like a canvas top shelf? The link for it looks different on Target and Amazon’s website. There is a canvas flat area at the top, but I don’t think you could safely store anything on it. Maybe they changed the design so people wouldn’t try? Hi Natalie, I’m so excited you’re doing the book idea for your son’s nursery! It’s one of my favorite projects ever. 🙂 I found the bins in a nice gray on Target’s site, so hopefully it will work with his color scheme! If not, the exactly dimensions are also listed in the product listing. Here’s the link: http://rstyle.me/n/cu5ta9b5wxf I’d love to see a picture when you are done!